The brightness sensor is a light sensor for e.g. building automations. The innovative birghtness sensor comes with an integrated signal transducer - output signal 0-10 V.
The B+B brightness sensor is designed with a precise and long-term stable photodiode which is characterized by great industrial performance. The processing of the sensor signal into a voltage output signal (0-10 V) takes place with the latest transducer technology. In addition each B+B brightness sensor undergoes a 3-point-calibration within our inhouse ISO lab. This guarantees a high accuracy throughout the whole measuring range and enables an uttermost efficiency when the light sensor is integrated into your individual application. Moreover this brightness sensor can be operated either with DC- or AC supply voltage. 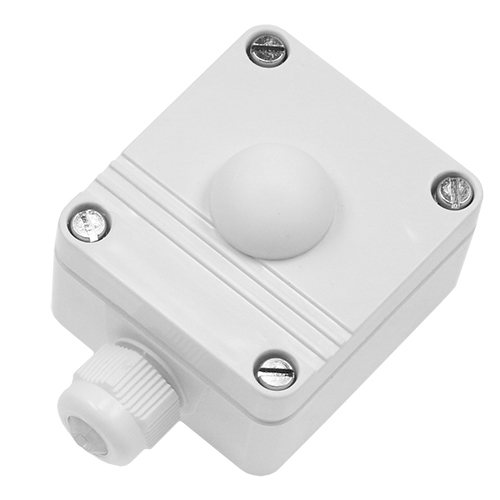 The birghtness sensor with its analogue output signal (0-10V) can be connected to any commercial automation system. Did you know? B+B offers also a birghtness sensor calibrated for 1.000 lux, which means a very high accuracy when it comes to indoor applications (SHOP 0555 3002) or a brightness sensor calibrated for 10.000 lux which is mainly applicated for light measurement indoors with specificly bright industrial light (SHOP 0555 3004).